Optimize Your Manufacturing Processes with a PVD Coating! Optimizing Industrial Applications for Over 22 years! Do the tools you use to make your product wear out? Are you always fighting manufacturing glitches that shut down production? If you answered yes to either of those questions, chances are a PVD coating will improve your manufacturing process and make you more profitable. 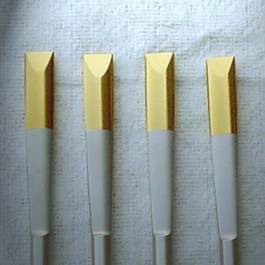 PVD coatings are wear resistant and abrasion resistant. If you have an application where a tool wears out and is made of a hardened tool steel, one of our coatings will make it last much longer, improving quality and your profitability. Shown below are some of the more common applications our coatings are used in, but there are many others that aren’t shown. If you have a coating application you’d like to discuss, give us a call, we’re sure we can help make you more profitable too. Punches not lasting long enough? 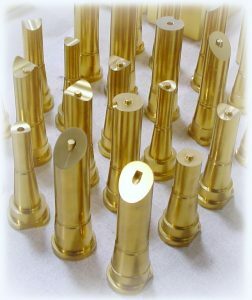 Get more bang for the buck with a PVD coating! 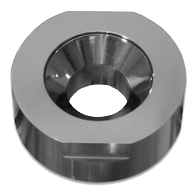 Coating a punch will make the punch last 8 to 10 times longer than uncoated. Instead of performing die maintenance, you’ll be pounding out profits. Is your press always down to remove galled material from dies? PVD coatings reduce the need for die polishing, enabling you to keep the presses running, making more parts and the company more profits. Want end mills and drills to last 2 – 7 times longer? 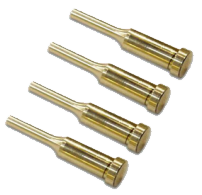 We offer four exceptional coatings for cutting tool applications. ​With a minimum charge of only $25, it doesn’t cost much to see how much you can improve your tool life. Molding abrasive plastic, or looking to reduce cycle time? PVD coatings reduce wear and improve release. ​Tools for injection molding applications are very expensive. Customers that coat these tools get $100, or more, back for every dollar spent on coatings. Want your medical device to stand out from the crowd? 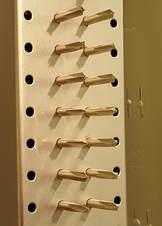 Add form and function to your medical instruments with a PVD coating. Whether you want gold or black or a color in between, our coatings will differentiate your products from the competition. ​Not all Coatings are the Same! Made of Tool Steel and Wears Out? A PVD Coating will Make it Last Much Longer!